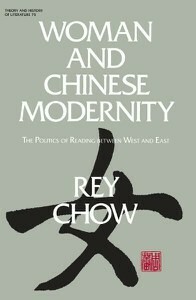 A critic of the way sinologists, Orientalists, and Western intellectuals have traditionally approached China and the “East,” Rey Chow refuses to assign China “absolute difference” from the West and instead stakes her ground “neither in the Chinese nor the Western but rather on a dialectic on which ‘Chinese’ and ‘Western’ is played” (WCM x.v.i.i.). As a consequence, Chow’s work is germane to many disciplines. She has written extensively on film, feminism, fascism, pedagogy, and the “modernism-postmodernism problematic.” Chow seeks to reread Chinese culture with the hope of “achieving an understanding of otherness that goes beyond colonial discourse” (Writing Diaspora) (see Orientalism). “The advantage of a continuous and complete institutional education, even when that education was British colonial and American, means that I have not been ‘subordinated.’ Even though my ‘personal’ history is written with many forms of otherness, when combined with the background of my education, is not that of victim but of a specific kind of social power, which enables me to speak and write by wielding the tools of my enemies” (Writing Diaspora 22). Chow received her doctorate in Modern Thought and Literature from Stanford University and went on to teach at the University of Minnesota. In 1992, she became Professor in the Comparative Literature Program at the University of California, Irvine. Later she moved to Brown University. Currently she works at Duke University. Author of several books and countless articles, Rey Chow is also co-editor of the Duke University Press series “Asia Pacific: Culture, Politics, Society.” Her book, Primitive Passions: Visuality, Sexuality, Ethnography, and Contemporary Chinese Cinema (1995) won the James Russell Lowell Prize in 1996. 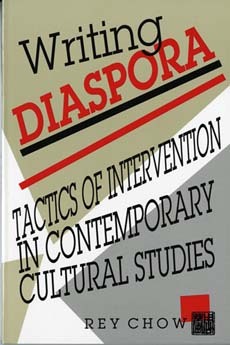 Rey Chow’s second book, Writing Diaspora (1993 – hereafter: WD), is a collection of eight essays centered on questions of an “intellectualization” of a “diasporic consciousness,” with the specific intent of showing the complexities and pitfalls of understanding both China and diaspora as fields of study (22). In doing so, Chow works towards intervening in the contradictions and complicities between scholarship, pedagogy, and the social and political situation between China and the West. Citing Michel de Certeau, Chow upholds the idea of a “tactic” over the traditional use of “strategies.” She maintains that a strategy belongs” to those who are committed to the building, growth, and fornication of a ‘field,’” and conversely, a tactic is “a calculated action determined by an absence of a proper locus” (16). Strategic attitudes lead to there-inscription of old ideologies while professing new found “solidarities” formulated according to a rhetoric of political change and difference. Although Chow is chiefly concerned with China in many of the essays in WD, she never allows it to become a “field.” Rather, she selects objects of study that include Chinese intellectual and political history, pop musician Hong Knog, language and literature departments in American Universities, and film in assembling points of intervention that never fall into specific disciplinary or geographic loci. According to Chow, the insistence on China’s difference from the West has been generated from within China as much as from without. Among those perpetuating a “culturally specific” context are the sinologists. Sinologists are a band of preservationists whose aim is to vouchsafe Chinese culture from modernity. The sinologist is fundamentally self-interested; and as China becomes increasingly modernized, it is overcome by the loss of a beloved object (4). Just as dangerous are the “Maoists,” who in their desire to be located in the other, valorize the other’s deprivation and espouse a self-righteous politic of lack, subalternity, and victimization (13). Chinese intellectuals — miserably strategy-less — are “vanguards” (in Barthes’ sense) who consult traditional knowledge rather than ask “What does it mean to be Chinese?” (WD 93). Further complicating matters are American universities that recruit “area specialists” and, in the process, “ghettoize” Chinese culture along geographic, rather than disciplinary, lines. Adding to that dilemma is the fact that Chinese literature is often taught as an object of the past in a sinologist’s mode or only as an afterthought to the language teaching that economic globalization demands. Arguably the most widely-read among Chow’s essays is the second in WD, “Where Have All the Natives Gone?” (see Myths of the Native). In this essay, Chow examines the construction of images of the “native,” which despite (or perhaps because of) their ubiquity, remain elusive. “Native” works, bifurcated as either timeless (the art museum sentiment) or historical (the ethnographic museum), are determined in post-imperialist discourse by the search for “authenticity.” Expanding Walter Benjamin’s “The Work of Art in the Age of Mechanical Reproduction” to include people as well as objects, Chow argues that questions about the native are questions about the irreversibility of modernity. If technological reproduction is inevitable, Chow inquires, is cultural displacement also? (48) (see Orientalism). Uncovering the dangers of looking behind the image of the “native” for a “true voice,” Chow points to the “gaze” of the native before becoming an image. Chow’s alternative not only recognizes an essential untranslatability of subaltern discourse into imperial discourse (35), but it does so tactically, with the native at the center of inquiry (see Spivak). Chow, Rey. Not Like a Native Speaker: On Languaging as a Postcolonial Experience. New York: Columbia University Press, 2014. Chow, Rey. Entanglements, or Transmedial Thinking About Culture. Durham: Duke University Press, 2012. Chow, Rey. Sentimental Fabulations, Contemporary Chinese Films: Attachment in the Age of Global Visibility. New York: Columbia University Press, 2007. Chow, Rey. The Age of the World Target: Self-Referentiality in War, Theory, and Comparative Work. Durham, NC: Duke University Press, 2006. Chow, Rey. Primitive Passions: Visuality, Sexuality, Ethnography, and Contemporary Chinese Cinema. New York: Columbia University Press, 1995. Chow, Rey. Writing Diaspora: Tactics of Intervention in Contemporary Cultural Studies. Bloomington: Indiana University Press, 1993. Chow, Rey. Women and Chinese Modernity: The Politics of Reading Between West and East. Minneapolis: University of Minnesota Press, 1991.
i really love the author Rey Chow’s Biography. And also his books Thanks Rey Chow for such life changing books ! !